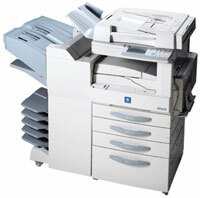 Minolta's DiALTA Di351 helps you stay competitive with digital productivity. It saves you time and money by letting you print, copy, and finish more documents in-house, more easily, professionally, and cost-effectively. With output speed up to 35 ppm, you can handle busy workflow traffic. Minolta's next-generation Micro-Toning High-Grade (MT-HG) System gives you true 600 x 600 dpi resolution with sharp text, clear graphics, and Photo mode for excellent halftone reproduction. Optional duplexing, sorting, stapling and hole-punching capabilities make it faster and easier to produce finished documents in-house and on-demand. Add the optional Pi3502 print controller, and you can scan originals and print or copy documents directly from your desktop PC with Optional PostScript Kit. of less than 70 seconds and first copy in just 4.6 seconds. multipurpose tray, 550-sheet fixed cassette and a single sheet bypass). user-friendly interface for digital printing functions. Dimensions (WxHxD): 25" x 25-1/2" x 27-3/4"
Weight: 133 lbs. 8 oz.